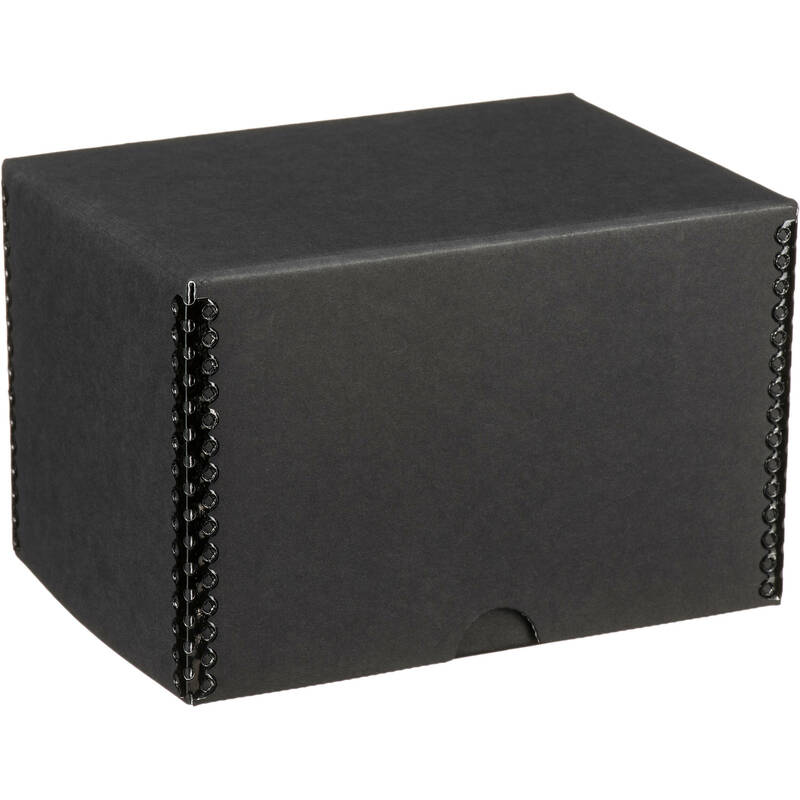 With rectangular dimensions of 4.5 by 6.5" and a depth of 4.5", this black Drop-Front Metal Edge Archival Storage Box from Print File can hold up to 450 unsleeved prints inside. Its two front corners are reinforced with black metal edges, which prevent the pack from being crushed if you decide to stack several boxes on top of one another. Removing the lid allows the front edge to drop, allowing for easy insertion or removal of contents. The Drop-Front Box is designed for long-term storage, helping conserve matted photographs, artwork, and other important documents. It is made with scuff-resistant 60-point board, which is acid-free and has a pH level between 8.0 and 9.0. Additionally, the box features a lignin-free construction and PAT-safe certification. Holds approximately 450 unsleeved prints. Box Dimensions (LxWxH) 7.25 x 5.45 x 4.7"
4.5 x 6.5 x 4.5" Drop-Front Metal Edge Archival Storage Box (Black) is rated 5.0 out of 5 by 2. Rated 5 out of 5 by Jeffrey from Its big! Its black! Its a box. I ordered several different sizes of this product. You open it, and put your valuable prints in there. No instructions are provided. I guess only time will tell, after I am long gone, if these are truly archival. But I suppose it wont matter as my kids will promptly but these in the fireplace after Im dead. But, if you need a nice black box with a hinge, I strongly recommend this box. 5 Stars!! Rated 5 out of 5 by Ron K from Does the job This is exactly what I was looking for--storage for small snapshot and wallet-sized photographs from the 1940s, 50s, and 60s.? I can store about 400 per box, and the hinged front flap makes it easy to access them.